Includes the complete albums “Space Flight” (Argo 1960) and “Iron City!” (Cobblestone 1967), which were Green’s only records between 1965`s “His Majesty, King Funk” -his only album for Verve– and 1969`s “Carryin` On”, his return to Blue Note. “Iron City” captures the guitarist in fine form, jamming on six blues and R&B numbers with his longtime cohorts, organist Big John Patton and drummer Ben Dixon. 09 Sep	This entry was published on September 9, 2016 at 8:34 am. 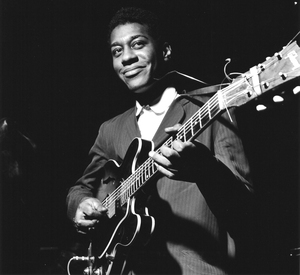 It’s filed under Music Video, Video and tagged Blue Note Records, Grant Green, Guitarist, Verve Records. Bookmark the permalink. Follow any comments here with the RSS feed for this post.